Vegetarian Cats & Dogs, written by the nationally recognized authority on meatless diets for cats and dogs, James Peden, tells a fascinating story. Starting with the amazing story of Little Tyke (a modern day vegetarian lioness), it follows modern day “Little Tykes” as new age felines (and dogs too!) live happily and healthily without meat. As a veterinarian being concerned with the animal’s health, it is very encouraging to observe health improving in many cases after being on the new regimen. I feel that this book will continue to play a vital part in the ongoing transformation of our present culture to a more loving, caring one that will place a much higher value on both human and animal life. As we observe the gentle, loving influence upon the lioness — Little Tyke, and the many dogs and cats responding dramatically to this influence, perhaps we can view this as a microcosm and then visualize the larger macrocosm of a gentle humankind where they are neither involved in the slaughtering of other humans nor of animals. 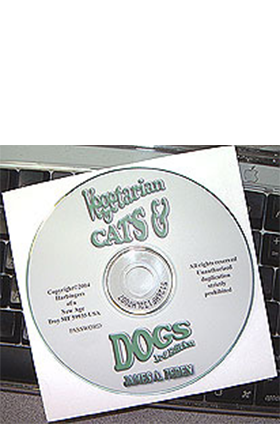 CD-ROM containing the pdf file of the full copy of Vegetarian Cats & Dogs (3rd edition) by James Peden. This is updated with current recipes and full color photographs and art. A high definition pdf is included with in the CD-ROM, suitable for printing. Now packaged in 100% post-consumer recycled material!